At the end of the summer, we decided to do a quick family getaway to Osoyoos. We had a really great time in the sun and on the beach. Osoyoos is a wonderful place for a family trip! 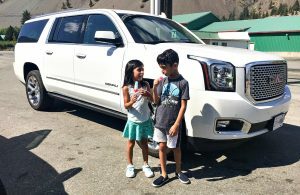 One of the highlights of our trip was the drive there and back in a 2017 GMC Yukon (Denali.) It was such a great ride and made the five hours there and back, pretty awesome. 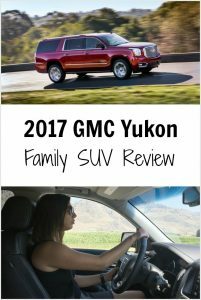 I had a lot of comments and questions as we shared about the trip on our social media so I thought a review of of the GMC Yukon was in order. When we picked up the car for the weekend, the kids were ecstatic! It is probably the roomiest SUV we have ever sat in and so luxurious. 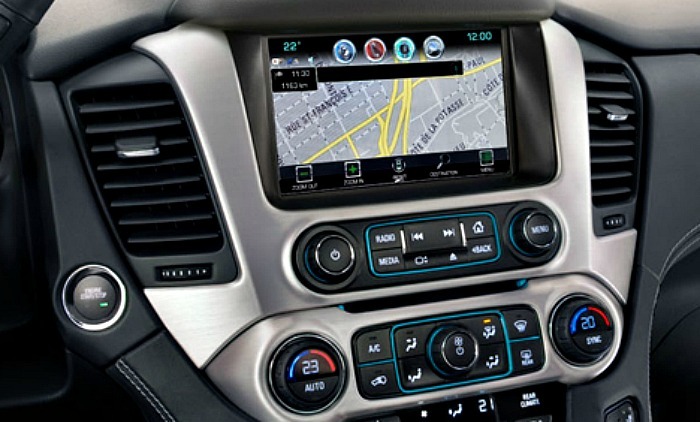 The technology in the car was just amazing. I actually had to flip though the manual to make sure we got to try and use every thing that the GMC Yukon had to offer. 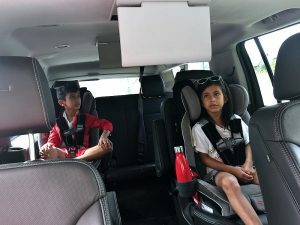 As a parent writing this review, I will be sharing about safety, technology and what makes it a good family SUV. If you want to know about horsepower and engine performance, you can find all that info on the website HERE. Of course safety is always important when purchasing a vehicle, but when there are kids in the picture, it becomes a primary concern. The GMC Yukon has all the usual safety features like air bags and child locks, as well as a whole lot more! 2. Rear Vision Camera – This is standard in the Yukon and it’s so great to make sure you see everything and stay safe when reversing. 1. 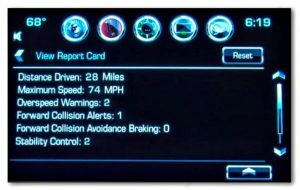 Safety Alerts – There is Standard Forward Collision Alert, Safety Alert for the Driver’s Seat (where your seat actually vibrates to let you know there may be a safety concern,) Rear Cross-Traffic Alert and Side Blind Zone Alert with Lane Change Alert. 4. Teen Driver – If you have a teenager or will in the near future, this is awesome! When your new driver is on the road, it’ll give them a speed warning if they go too fast, volume limit when they are listening to music, a radio mute if their seatbelt isn’t fastened and it’ll give you a report card of their drive. 2. We lost count of how many USB posts and power outlets the SUV came with. It even has a 110 volt three prong outlet to support all your devices. There is even a wireless charging station. 3. What the whole family also loved was the 4G LTE Wifi hotspot (with a free 3-month trial.) It was seriously amazing! We could use our phones and iPads without using up our data! 4. There are two screens, one in the second row and and one in the third passenger row so everybody can watch comfortably. 5. There is also standard remote vehicle start, including extended range remote keyless entry. 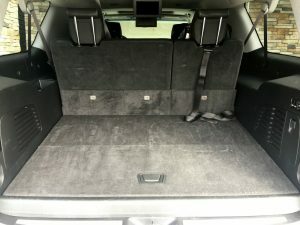 – The GMC Yukon comes with a roomy third row that is really easy to access. – Even though there is a third row, the Yukon still comes with an ample, roomy trunk. 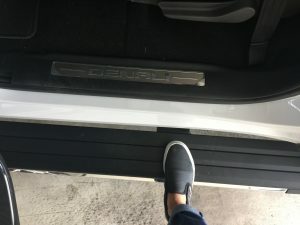 – There was a power step assist which means when we opened the door, a step would automatically come down to help us step into the vehicle and once the doors were closed, the steps would come back up. Overall, we absolutely loved driving the GMC Yukon! It is a luxury SUV, that is easy to drive, comes with all the safety features and amazing bells & whistles to make it a great family SUV. 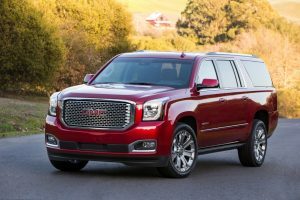 For more details on the GMC Yukon Denali, check the website HERE. *Disclosure – Thank you to Chevrolet Canada for providing our family with the 2017 GMC Yukon to test drive.